Eine feuchtigkeitsspendende Essenz, die zu 92% aus Schneckenschleim besteht. 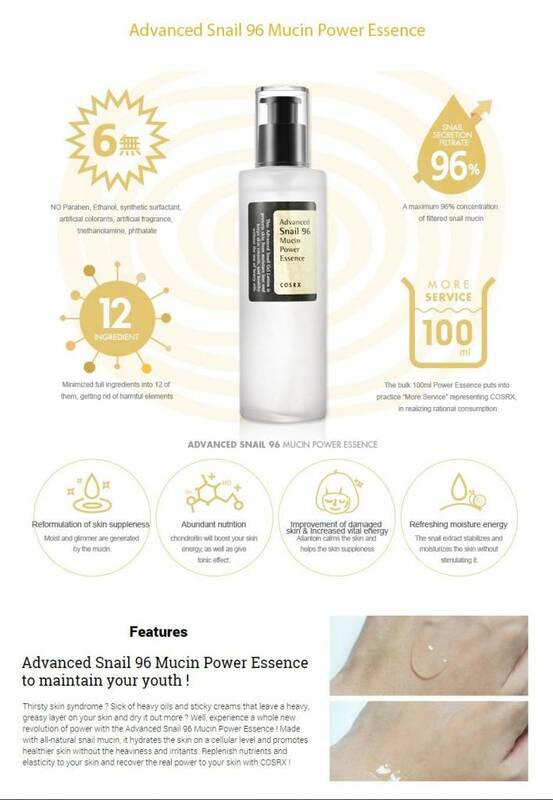 COSRX Advanced Snail 96 Mucin Power Essence ist eine feuchtigkeitsspendende Essenz, die zu 92% aus Schneckenschleim besteht, um die Haut zu beruhigen und Hautschäden zu reparieren. Sie nährt die Haut außerdem mit Vitaminen und versorgt sie mit einer hohen Dosis an Feuchtigkeit, die sich leicht und frisch anfühlt. 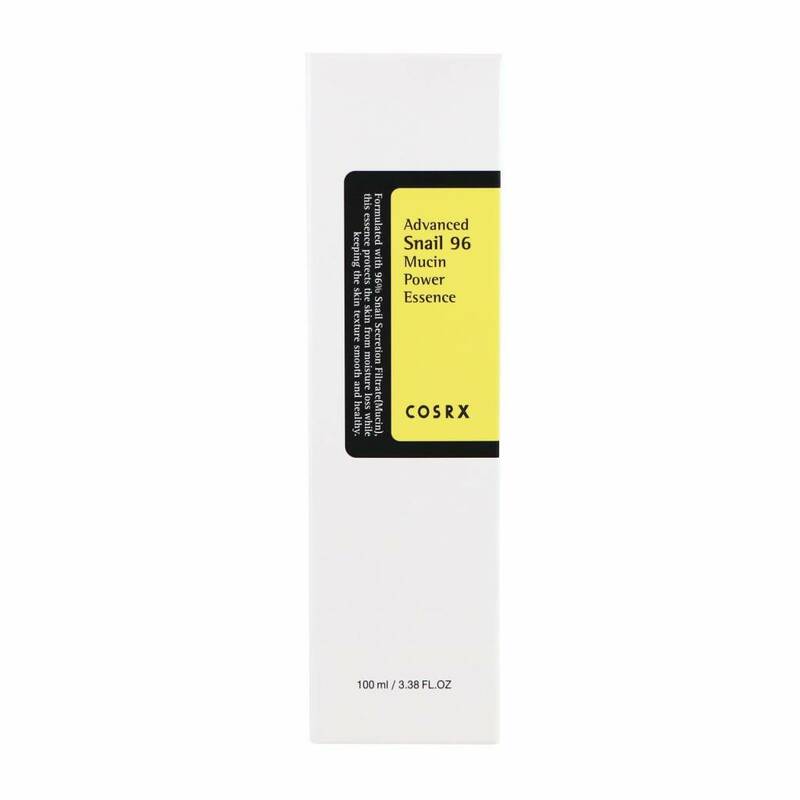 Für ein perfektes Resultat mit der COSRX Advanced Snail 92 All in one Cream kombinieren. Für alle Hauttypen geeignet, inklusive sensible Haut. Tragen Sie morgens und abends eine geeignete Menge auf die gereinigte Haut auf. Klopfen Sie das Produkt in die Haut ein, bis es vollständig eingezogen ist. Bringen Sie ein Serum und eine Gesichtscreme Ihrer Wahl an. Für ein perfektes Resultat kombinieren Sie das Produkt mit der COSRX Advanced Snail 92 All in one Cream. Het werkt tegen fijne lijntjes. Ik zal zeker opnieuw aanschaffen. Onmisbaar product voor mijn huid. 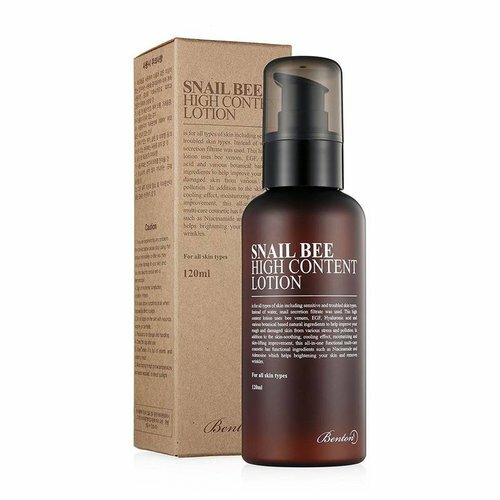 This is my favourite snail product. 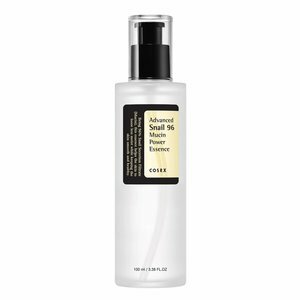 It hydrates and plumps my skin without breaking me out. I didn't notice a big difference in my hyperpigmentation but it did help to even out my skin tone. Fijne essence! Ik gebruik het als onderdeel van mijn avondritueel; voor overdag gaat mijn huid er iets teveel van glimmen. Ik had weer eens teveel aan mijn huid zitten pulken en de essence heeft geholpen mijn huid supersnel weer te laten herstellen. Top dus! 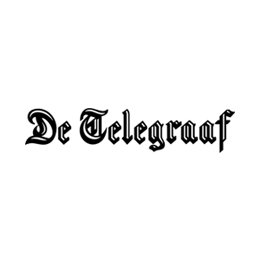 A very easily applied essence that is also lightweight. Some of the redness in my face has calmed down, as well as some scars that have softened. On its own I didn't notice a visible result, but in combination with another soothing essence I can see a boost in reducing redness and inflammation from breakouts using this essence. Ik gebruik dit product als moisturizer in de nacht voor mijn vettige, vochtarme huid. Het product hydrateert heel goed. Verder merk ik niet echt verschil als het gaat om het vervagen van littekens ofzo, maar ik mis het product wel als ik het een dagje niet gebruik. Beste product om je huid weer te herstellen van beschadigingen en hyperpigmentatie. Ik ben erg blij met deze aankoop en zal het zeker ook een lange tijd blijven gebruiken. And this is the one I bought, the Cosrx Advanced Snail 96 Mucin Power Essence. I’ve been using this for a while now and my skin feels indeed more hydrated, smooth & bright. 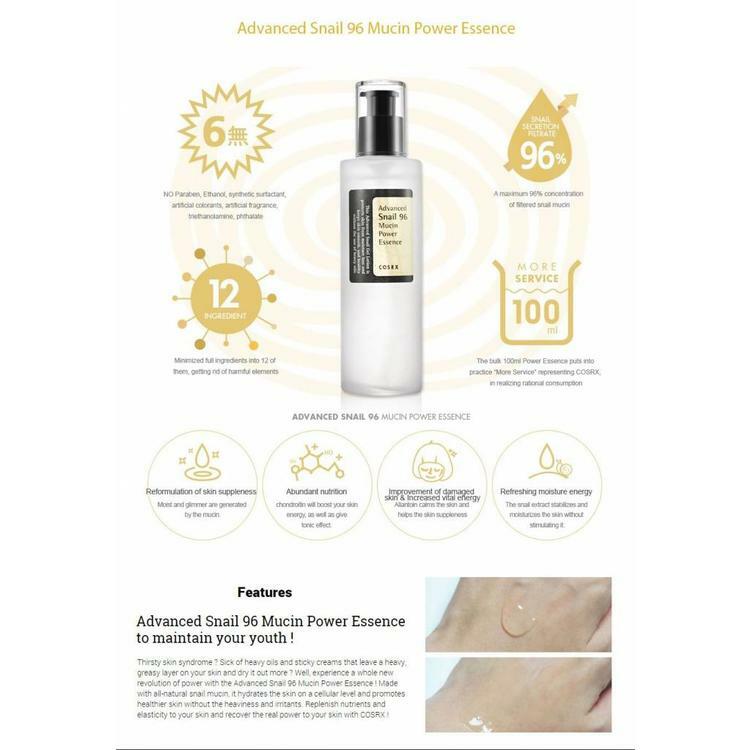 It sounds even better if we think that we are getting this results already in the step right before the moisturiser, I mean… that’s amazing right?! Покупала два раза. при прыщиках помогет. Кожа не жернится так сильно. 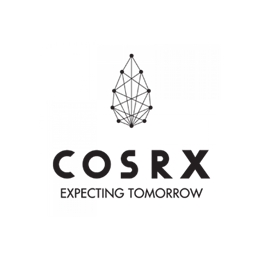 Советую. 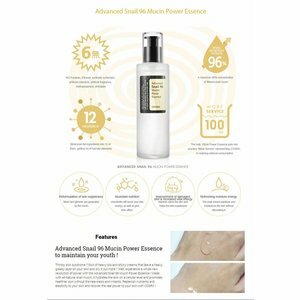 super product!!! Helpt tegen puisten en acne vlekken, helpt het huid te herstellen. All the hype about this product is WELL DESERVED. My holy grail products of all time! This stuff is amazing! 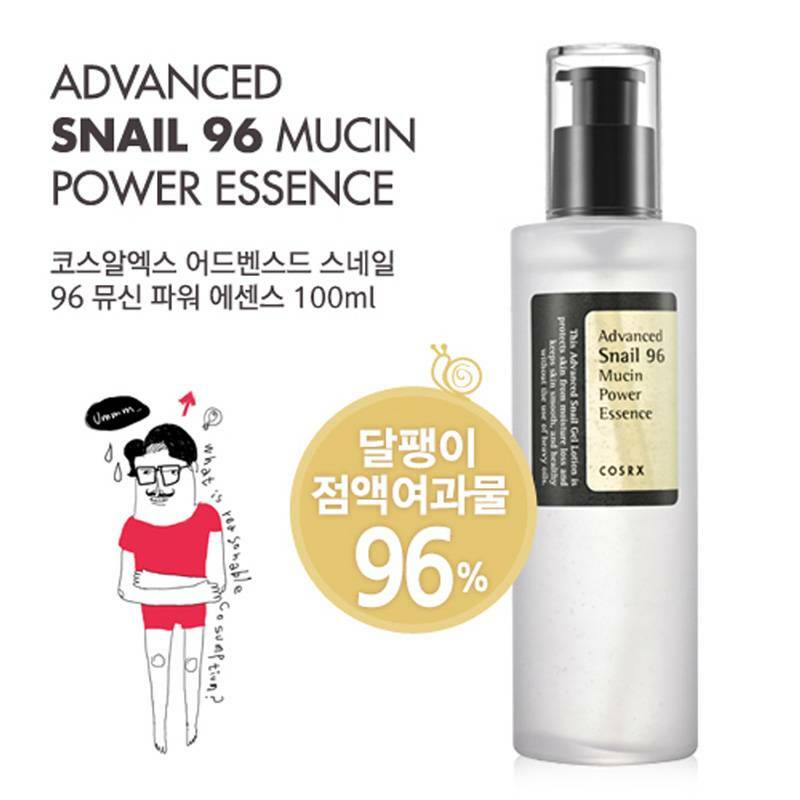 I love everything snail extract, so 96% snail mucin? I had to buy this. This product really calms down my acne-prone/sensitive skin and it heals my skin so well. It really moisturizes my skin as well. In the winter I use this in the morning and at night, because my skin is quite normal then. However in the summer I get more towards the oily side, so I only use this at night when the weather gets hotter. I can't describe how much I love this product. If I had to recommend one product to anyone, it would be this one. Best product I've ever used. I had a minor scar on my cheek from surgery. It never faded with the prescription ointments, but now since using this essence it has almost disappeared. Further, it makes my skin glow and super soft. Definitely a holy grail skincare product!! 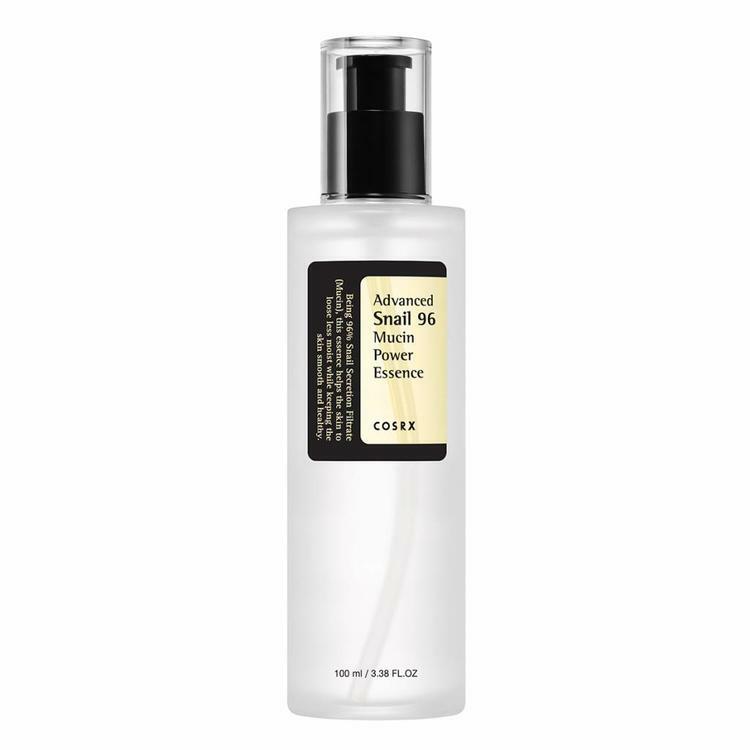 This is a must in my skincare closet, I've bought it numerous times. 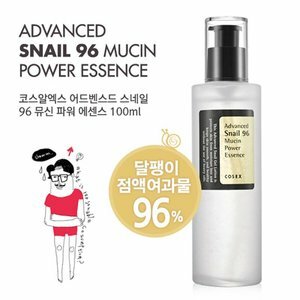 I love snail mucin as a powerful healing ingredient, so this product got my heart by default. :) Though it's not exactly an 'essence' type of texture, but what else would you expect from a 96% snail extract? Calming, hydrating and soothing, it's a great product for a summer vacation: you can slap it on as many times as you get out of the pool. I bought this once in summer and I didn't like it at all. However, this winter my skin has been acting up and I started using this essence again, and now I love it! I will probably have to stop using it again in summer though, with my oily skin. Most likely my favourite product to ever exist. 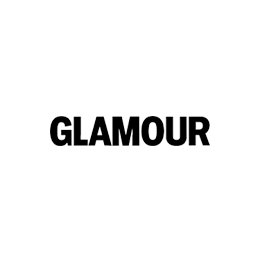 Has helped tremendously with fading my forehead bumps and smoothing out my skin texture. Even my post-inflammatory hyperpigmentation isn't as bad as before since I've been using this. Would fully recommend! 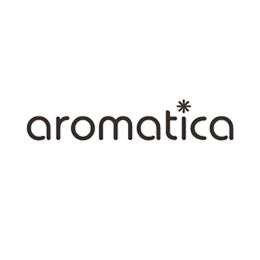 Ein milder, feuchtigkeitsspendender Toner, der Anti-Aging- und entzündungshemmende Inhaltsstoffe enthält. 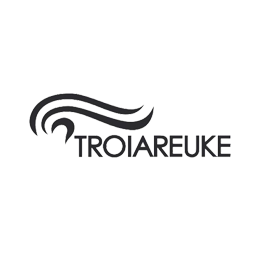 Bringt eine zusätzliche Schicht an Feuchtigkeit in die Haut und reguliert die Talgproduktion. Eine konzentrierte Essenz mit verschiedenen natürlichen Inhaltsstoffen. 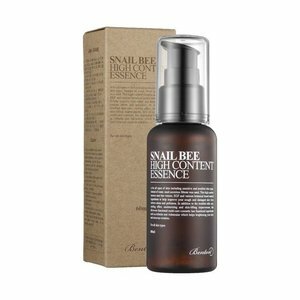 A hydrating essence with Snail Slime extracts and EGF that increases the rate of cell renewal and healing.